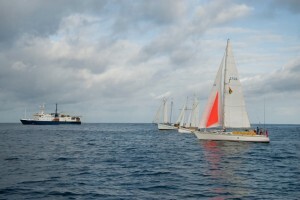 The Oil Free Seas Flotilla took to the North Island’s wild West Coast in November ’13. Six yachts sailed from as far as Bluff and Auckland’s East Coast to join in protest against Texan oil giant Anadarko’s untested drill ship’s arrival in Deepwaters 110nm West of Raglan. Veteran flotilla vessel, Vega, held her ground above the drill site as the drill ship moved in to prepare to drill one and a half kilometres beneath the waves. The yachts kept vigil at the site for 10 days and nights and departed the site only after Anadarko had begun their drilling, so as not to increase the already unfathomable risks. We are a coalition of individuals and boat owners who want to raise our voice against the inherent dangers that deep-sea oil exploration brings to New Zealand oceans and coastlines. We also want to raise our voices against the new legislation that takes away our long-standing right to peacefully protest at sea with our boats. We have a long tradition of non-violent peaceful protest at sea. This includes the peace flotilla that eventually stopped nuclear testing at Mururoa, the nuclear free flotillas that stopped plutonium shipments through the Tasman, and, most recently, the Stop Deep Sea Oil flotilla off East Cape, that, together with the Iwi and Greenpeace, managed to chase away Brazilian oil giant Petrobras from our shores. Now we have the unwelcome company of another big oil company, Anadarko. Anadarko was one of the key companies involved with the Deep-water Horizon oil disaster in the Gulf of Mexico, has begun some very high risk exploratory oil drilling in deep water (>1500 meters) off the coasts of New Zealand. Our government has invited deep sea oil companies here despite our lack of necessary disaster response facilities and infrastructure that would be required to respond to a disaster such as the Deep-water Horizon blow-out in the Gulf of Mexico. Maritime NZ has a capability of dealing with a spill of 3500 tonnes while the Gulf of Mexico spill was 650,000 tonnes. We are totally unprepared for this deep sea drilling industry. New Zealand is already seen as a marginal operating environment by big oil companies because of our remote location and unproven resources. An additional deterrent for big oil companies is the willingness of New Zelanders to go out to sea in small boats in order to protect the environment and peacefully demonstrate against deep-sea oil drilling activities. It is for this latter reason that the deep-sea oil industry recently persuaded the government to bring new legislation to stop peaceful protest at sea. We care what happens to our marine environment and coastlines. 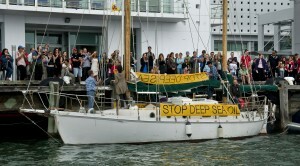 With our peaceful protest at sea, we oppose deep-sea oil exploration from going ahead along our precious coastlines. We have seen what a deep-sea oil accident looks like in the Gulf of Mexico. We have also seen how difficult it was for the New Zealand authorities to deal with a much smaller amount of 350 tonnes of oil spilled from the Rena disaster in the Bay of Plenty. This is the time to stop deep-sea oil exploration before it has established itself firmly on and off our shores. We have shown big oil and the government that this country is not up for sale. That we care what happens to our marine environment and coastline. Exploratory drilling began around the 26 November of this year (2013), with a window extending into early next year. The same drillship Noble Bob Douglas is due off the Otago coast in early 2014.